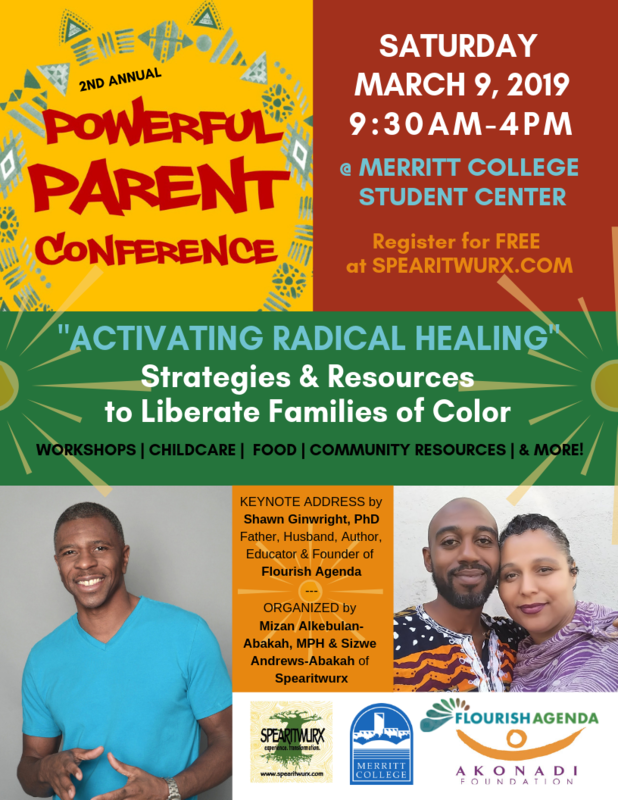 Spearitwurx will organize the 2nd Annual Powerful Parent Conference on March 9, 2019 at Merritt Community College. ​This conference will provide safe space for parents & youth to share strategies on how we build safety, sustainability, and solidarity. We will coordinate interactive workshops on topics such as agency and activism; cultural tools for resilience; strategies for community and emotional safety; and healing from inter-generational trauma. We will provide powerful activities for youth participants as well as healthy farm-to-table breakfast, lunch, and snacks. The 2019 Powerful Parent Conference will continue to create space for us to develop tools, share resources, and strengthen authentic connections that build resiliency, conjure safety, and demand self-sustainability and self-determination within Black, Brown & Asian families. Our Parent engagement work is centered around the theme of Safety, Sustainability & Solidarity and create safe space for parents to reflect, heal and grow. Through a dynamic and responsive curriculum, we will provide parent/caregiver retreat sessions designed to deepen our understanding of the forces that shape our parenting. We provide opportunities to explore healthy communication and family rituals, self-care and sustainability, and discuss how these are both tools for developing our immunity to social toxins and heal from our individual and collective trauma. We also discuss discipline strategies for building trust, resiliency, responsibility, and respect and explore ways to empower resiliency in our families. 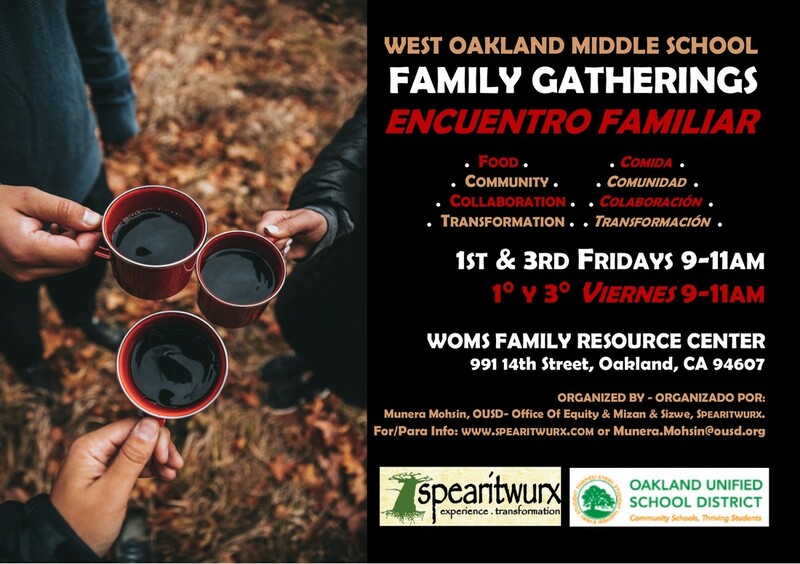 West Oakland Middle School Family Gatherings - 1st & 3rd Fridays 9-11am in the Family Resource Center of West Oakland Middle School. These sessions are FREE to the community. Food & childcare provided. 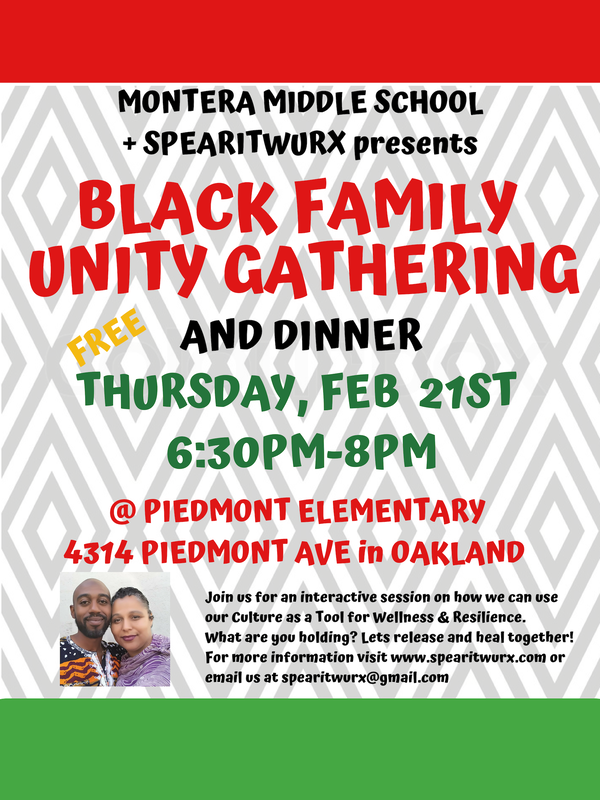 Montera Middle School Family Unity Meetings - 3rd Thursday evenings January to May 2019 6:30-pm-8pm . Held at Piedmont Elementary School - 4314 Piedmont Ave 94611. These sessions are FREE to the community. Food provided.